Estadio Las Gaunas got built in 2002. It replaced the old Las Gaunas, which had stood further south but did not meet the standards of modern time. Construction of the new stadium had started in 1997 but taken longer than planned. The new stadium officially opened on 28 February 2002 with a friendly between Logrones and Alaves (2-1). It has hosted two matches of the Spain national team. The stadium was initially the home of CD Logrones, and after the club went bankrupt in 2009 became the home of two successors: UD Logrones and SD Logrones. 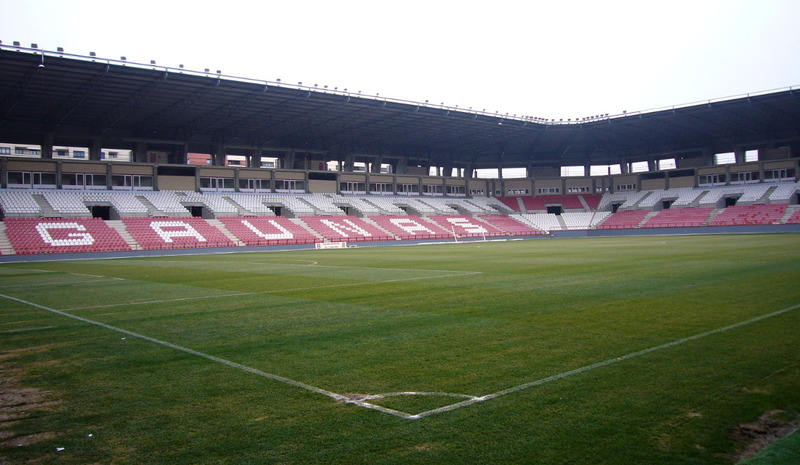 Estadio Las Gaunas is located just south of Logrono’s city centre. The walk from the city’s old town takes about 15 minutes, that from the train station and bus terminal south of the centre even a few minutes shorter. Direct trains connect Logrono with Zaragoza and, though only a few a day, Barcelona. From Madrid a change is needed. Buses are more useful if travelling from regional places like Bilbao or Pamplona. Logrones tickets can be bought at the stadium on the day of the match. Logrones doesn’t sell out in the lower leagues. Tickets cost either €15.00 for a seat behind the goal or €25.00 for a seat at the side. Udlogrones.com – Official website of UD Logrones. Lariojaturismo.com – Logrono tourist information.